One of my best friends works at Jefferson Tap and she always wanted me to come stop by. One day, I decided to order take out to give the food a try. This late night bar and grille located in the West Loop is a little off the beaten path, but both their atmosphere and food draws a sizable crowd. The staff is extremely friendly and welcoming. I remember sitting at the bar once being introduced to my friend's co-workers and having a great time. The food when ordering at the bar is all pretty good, but for some reason, the take out is just a little less appetizing. I found most of the food to be above average, but the simple garnishes or lack of a decent topping made me think twice about their overall rating. The portion sizes and cost are excellent, even for a student's budget. Just ordering a couple appetizers for you and a friend should be enough. Anyway, because of the lack of memorable food and the small flaws on each dish, I decided to give them a 3.5 mile rating. It will probably change as I eat more food at the bar rather than ordering take out. We decided to order a couple appetizers for our meal. The first one was the buffalo wings. We chose hot buffalo sauce with a side of blue cheese. It came with a few carrot sticks... but no celery? Anyway, the sauce was ok. Nothing too spicy (which was a little disappointing). The chicken wings were typical. However, I don't know if the blue cheese dressing was homemade or from a jar, but regardless, it was incredible. My friend and I were addicted to this blue cheese dressing. 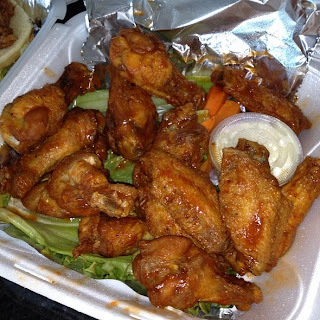 They did serve the wings on a bed of leafy lettuce, which turned into an unappetizing soggy leaf from the take out box. Maybe refrain from those pointless garnishes next time... just a suggestion. Another one of their appetizers is the pulled pork sliders. 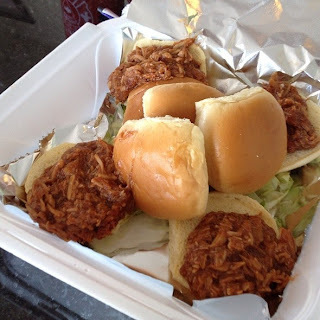 These mini sandwiches are served on sweet hamburger buns and topped with a generous portion of their homemade BBQ pulled pork. The meat was tender and the BBQ sauce had a nice sweet, yet tangy flavor. The buns were soft, almost a little too soft to hold all the meat. They were served on a bed of lettuce, but I think it would have been nice to have a little vinegar based coleslaw or some pickled onions as an accompaniment. Definitely better than average, but a simple slaw would elevate it to the next level. - Late night bar... I believe it is open till 5AM. - They also serve brunch on weekends! - I wouldn't come here if you enjoy being around "in-your-face" fans during big games. This place is a little more mellow, but still a great atmosphere for watching sports.